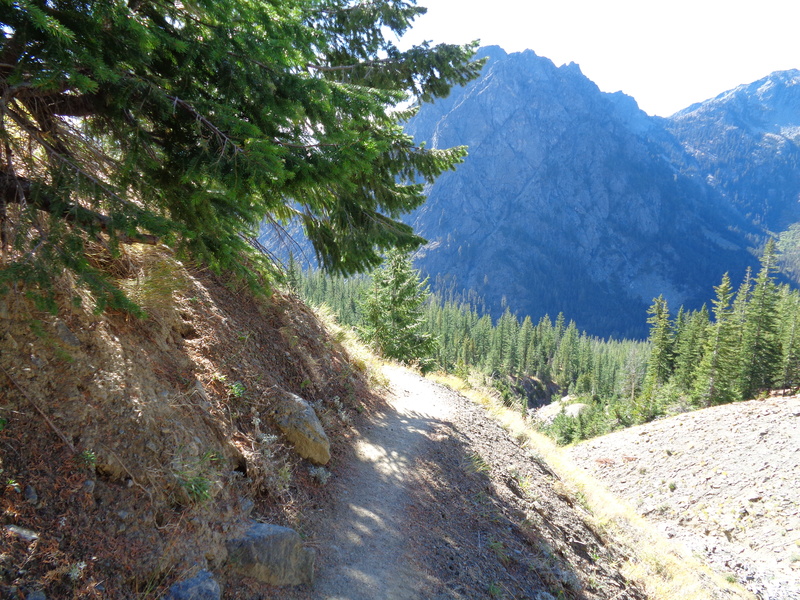 I was all the way out in Leavenworth this past weekend for Oktoberfest, and figured since I was already out there I might as well find a hike to do in the area. Something too far from Seattle to justify in a day trip, but “on the way back” (loosely defined) from Leavenworth. 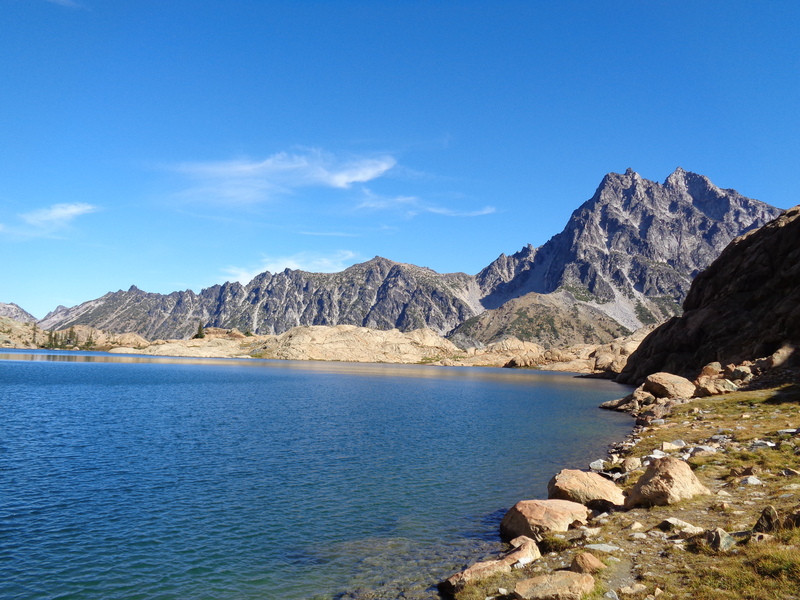 Lake Ingalls was the answer, and I’m pretty damn glad it was. 10/10 would hike again. No, 100000/10. Just spectacular. I’m just going to center this picture now because it might be my favorite of all the pictures I’ve ever taken in my life ever. The rocks on the right were way too cool to pass up, and the larches were bright yellow and the sky was a clear blue and I didn’t even realize this was a good picture until I got home. I swear I’ll figure out how to make that damn sky blue. Edit: Fixed the sky! Not perfect, but for a first touch-up, come on it’s okay. Okay, now that we’ve got that out of the way, I can focus on the actual hike. Which was incredible! I’m too excited remembering it to type about it. I’d go back in an instant. Skip work, toss the tent in the car, and go. Which is what I should have done. I had run a half marathon the day before, and I wasn’t sore, but I was lazy and ended up strolling this. I forgot my trail running shoes too. Usually I have a spare pair in my trunk, but not this time, so I wore regular sneakers. Anyway, parking lot was absolutely packed, but I was lucky enough to get a spot right next to the trailhead since someone was leaving (the car right behind me ended up parking a mile down the road – ha!). So many people means it would have been tough to run anyway, so no big whoop. I passed tons of people on the way up. Gradual uphills and switchbacks for the first few miles. Good views of Rainier and Adams. Embarrassingly, I had to ask people “What’s the big mountain that’s not Rainier?” but it took a few tries to find someone who knew the answer. Lots of red rock, which I didn’t expect, but it made everything look very cool. 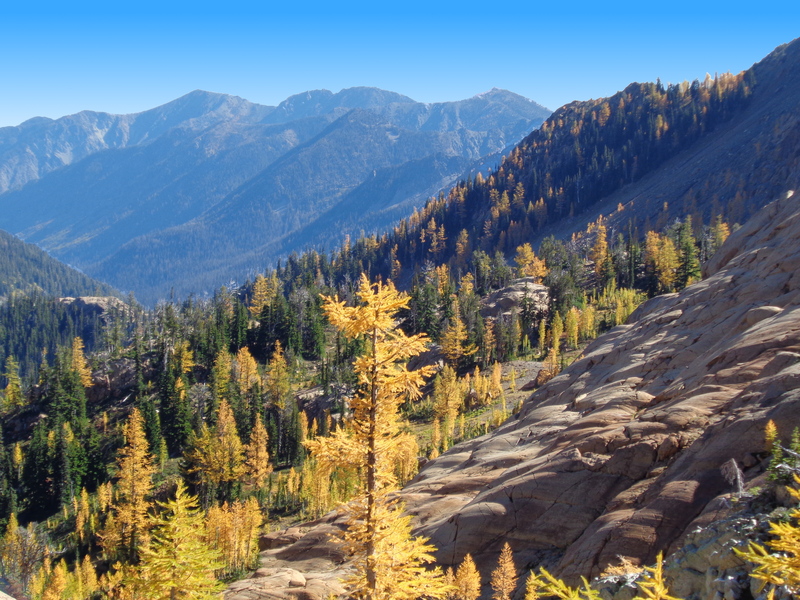 Once you cross over the ridge overlooking the valley, you get great views of Stuart and all of the larches down below. 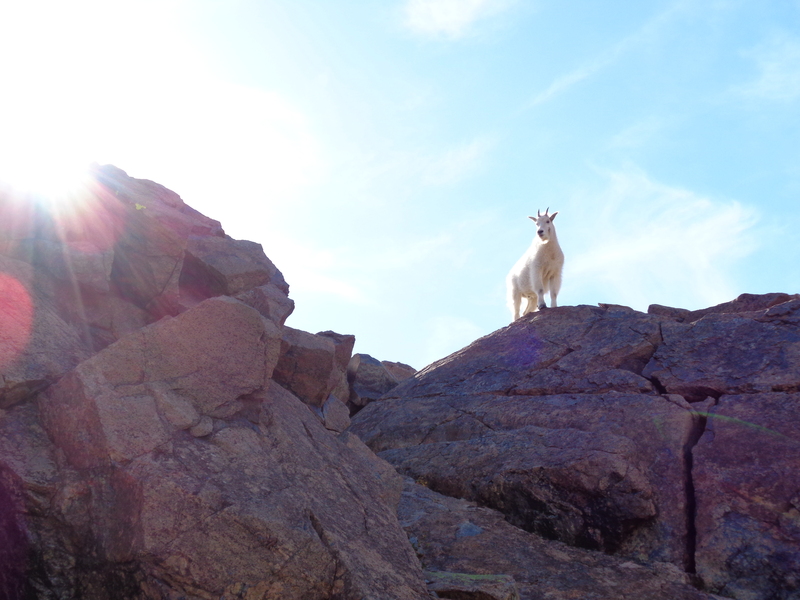 There were a few mountain goats along the trail, completely unphased by people. I had never seen one before, so everyone was snapping pictures and I was standing there like can I just walk past? Will it get angry? Should I be worried? The answer is no, they’re basically waiting for you to pee because they like the salt in your urine. So go pee on a rock and consider it a fair trade for the 50 pictures you probably took of them. This girl knows where it’s at. 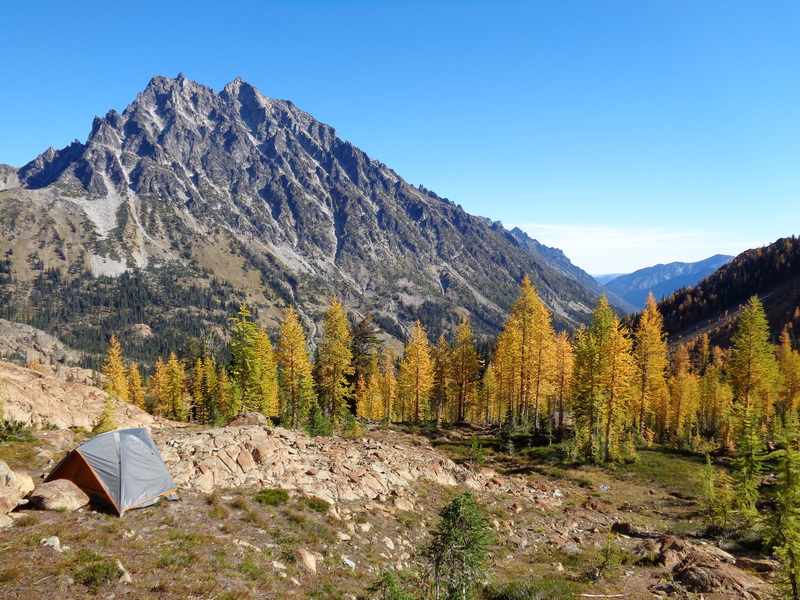 Her tent was perfectly situated near the edge of a rocky drop-off which you can’t quite see down to the valley, with great views. She gave us permission to take a pic. I think she knew I was wallowing in self pity and jealousy because I can imagine nothing better than seeing sunset and sunrise over Mt. Stuart and that valley in fall. 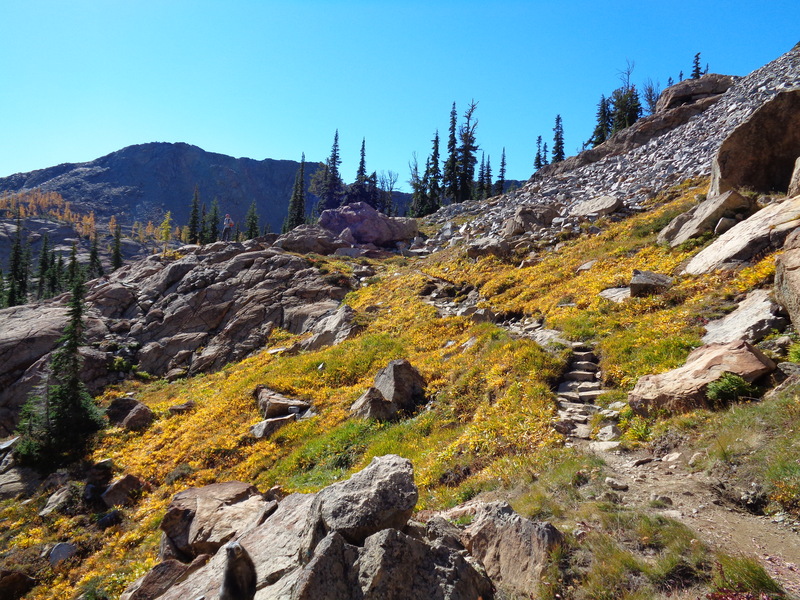 What’s funny is the larches were all green towards the bottom of the trail, which started around 4000ft above sea level. I was worried when I started hiking, but the higher I got, the more yellow they became. The trail completely flattens out once you reach the valley. At least, until the rock fields that require some scrambling. Definitely follow the cairns in those areas – I have terrible trail skills and ended up climbing some pretty large boulders. On the way down, I ended up jumping off one that was three feet taller than I am – too impatient to backtrack and find a new path. But if you pay attention, it’s doable for everyone. Lots of families hiking that day. The last stretch up to the saddle (terminology?) that cuts through to the lake is pretty steep. No particular path to get up, just follow what seems reasonable. 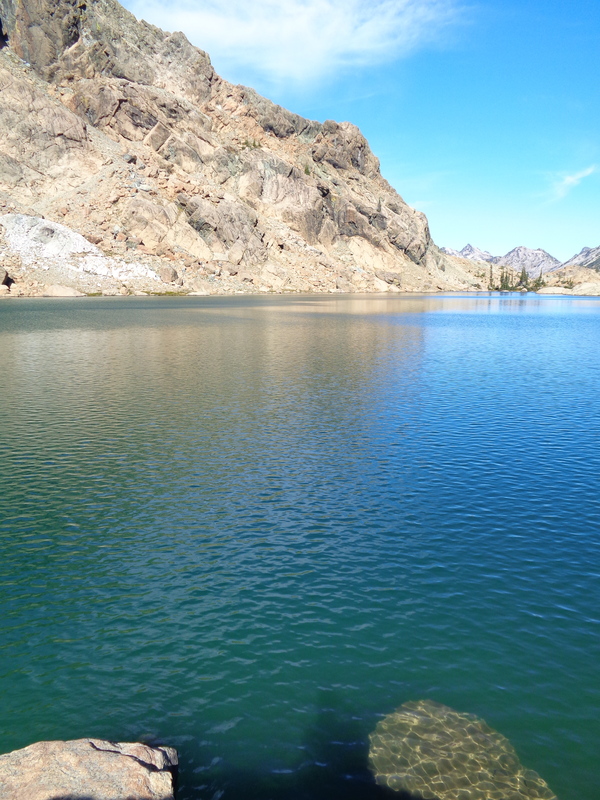 The lake was almost anti climactic compared to the views in the valley, but looking back on it, it was still pretty beautiful. Lots of people at the top having picnics, enjoying the views, even a few guys fishing! I didn’t see them catch anything, but they said there were fish up there. The water was so clear I was hoping I’d see some, but I never did. I only spent 10 minutes there since I had to be back in Seattle in time for dinner reservations (and looking presentable, not like I had just hiked for hours). On the way back down, this stretch looked nice, and there was a fat, bold marmot off to the left that you can’t see in the pic (he was there, I swear). People must have fed him, because he was a foot off the trail and just sat on his hind legs staring at everyone that passed. I got called out by several of the groups I had passed on the way up, they remembered me and knew I had only spent a few minutes at the lake. “What, five minutes at the lake and you’re already leaving? !” I laughed, but it killed me to leave. I wish I had camped there, spent the night, enjoyed the views, had a picnic on the rocks by the lake, had time to climb around to the other, less populated end of the lake, maybe even gone for a quick swim. I considered bailing on dinner 100 times over, but I couldn’t pass up a Lecosho pork chop. Next fall, for sure. I’m not missing that opportunity again. Two silver linings on the way down, if you’re really trying to look on the bright side of things. First, this goat was basically begging to have his picture taken. Okay, King Goat, I’ll take it. But I’m not going to pee for you. How’d you get up there anyway? How will you get down? You don’t look like those goats that climb dams. Too white and fluffy. And one last picture another one that’s an Eve trail classic. Trail turning around a corner, great views on one side. The type of picture I look at when I’m unmotivated and don’t want to drive an hour to the trails. Side note for those who know me: yes, I do get sick of driving. It has been known to happen. I saw two trail runners, one doing hill repeats on the way up (long and slow to get heart rate up he said) and one who hiked to the top and then ran down. You can’t tell how step the drop is in that picture, but it’d hurt a bit to slip off of that. But that’s never stopped trail runners in the past. I’ll go back there to run it someday. Maybe when I’m more in shape and my uphills aren’t so slow. Once I’ve adjusted from my flatlander years in Chicago. Hike up, camp, wake up the next morning, run, and then hike down maybe? I have another 11 months to figure it out before the larches are yellow again. Plenty of time to plan, and wait. I hate waiting. Look at that clear water. Should have gone for a swim. 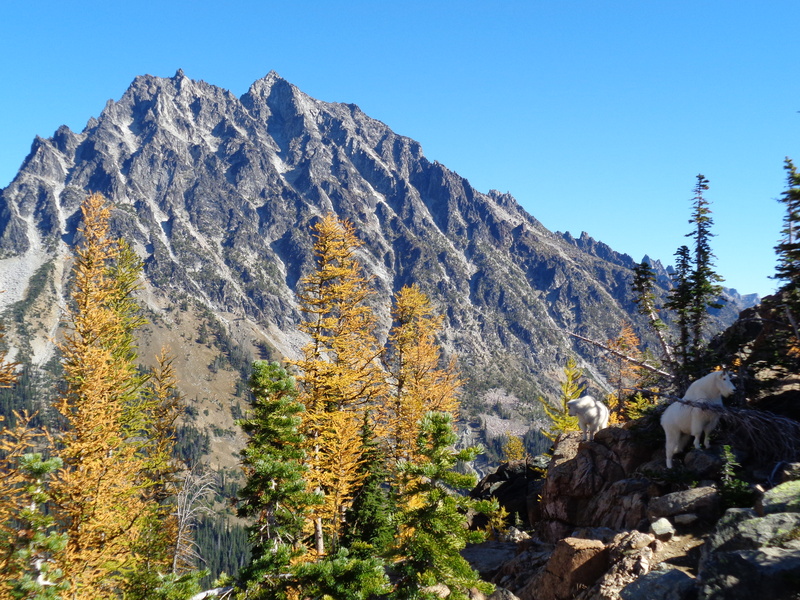 This entry was posted in Fall Foliage, Snoqualmie Pass, The Teanaways. Bookmark the permalink. Freezing! But once you’re there, you can’t not jump in, right? And I bet it’s worse in June.. I’ll report back in the spring! That water is so sweet! Can you drink it? I’d say treat it just to be safe especially since it’s a lake, but doesn’t it look amazing? And I thought the lake was anti climactic at first! I could do this hike a hundred times and never be sick of it.